Last weekend, spring was in the air at last! It was a perfect kind of weather to go on a last-minute day trip. So we jumped on the train to Helsingør, 45-min away from Copenhagen towards north. Well known for its majestic castle made famous by Shakespeare’s tragedy Hamlet, this small town, exposed to the winds coming from the Sound, is also incredibly charming. Helsingør – Elsinore in English – is a small town of 61 500 inhabitants, located at the north-eastern edge of Zealand Island. It stands at the narrowest point of the Sound (Øresund), facing its Swedish sister, Helsingborg that we can clearly see on the other side. Situated on a strategic place of the Sound, Helsingør controlled the entrance to the Baltic Sea. The Danish Crown asked for a right of passage to every ship that passed on the Sound (c. 200 euros, quite expensive for the time). Those who didn’t pay we greeted with canon ball. That’s all. The ‘little brother’ of Copenhagen’s Little Mermaid: Han (He) is a work of art by artists Elmgreen & Dragset (2012). He has been nicknamed ‘The Little Merman’ by the inhabitants of Helsingør. Kronborg Castle was built just by the Sound to be visible to anyone who passed by. Besides paying the tax, each ship had to lower the sail as a sign of deference to the King. From outside, the castle is quite majestic with its few towers and turrets, and its wide number of tiny windows. 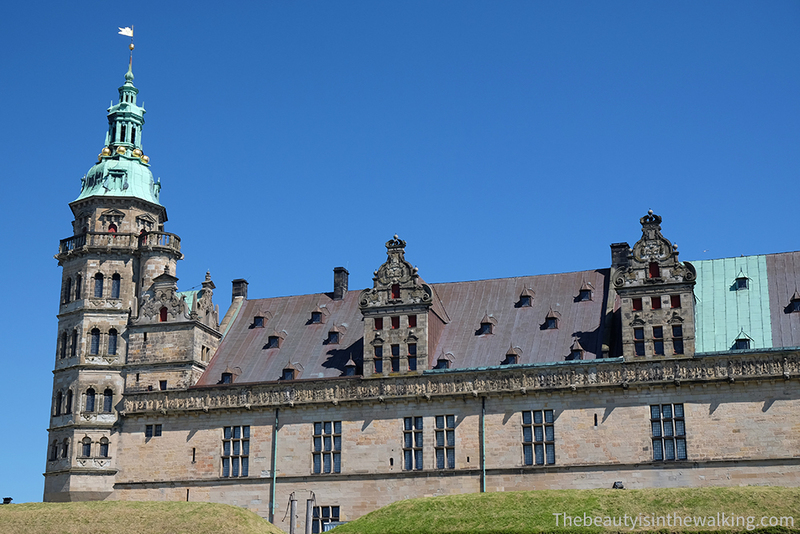 We can understand why it inspired Shakespeare’s Elsinore Castle in its tragedy Hamlet, which has today its own annual festival held in Kronborg Castle incidentally. A first castle had been built there around 1420, but a century and a half later, King Frederick II had it transformed into a magnificent Renaissance castle. In 1629, it was partially destroyed by fire and identically reconstructed by his son, Christian IV. Since 2000, it has been added to UNESCO’s World Heritage sites list. Inside the castle, several rooms are open to visits, like the King and the Queen’s private apartments, the dining rooms, the King’s office, the ballroom, etc. They look radically different from the ones in French castles; here, interiors are relatively bare. There are neither double doors, nor gold decoration in every corner. It’s rather plain, with however nice sophisticated chimneys, beautiful decorated ceilings and an impressive collection of tapestries. The Chapel is gorgeous, and notably the many sculptured characters on the side of the benches, as well as the magnificent pulpit. I like to cast a glance through the windows to see the ornaments, a piece of lace curtain, or a piece of furniture. How did tenants occupy that space that went through so many years and hosted so many souls? I love those places that tell stories just by watching them. And, here and there along the path, there are also a few nice buildings that are worth stopping by, like the cloister of an ancient Carmelite priory joined on to the Gothic church, Sct. Mariæ Kirke. It is a true haven of peace where we can hear the birds singing and feel the coolness of old stones. Unfortunately, the church was closed at the time we went there (it closes relatively early in the afternoon!). There is also Saint Olaf Cathedral (Sankt Olai Kirke) that we can’t miss with its high verdigris green tower (that was also closed when we passed by…) and, in one of the main streets, the city hall is also notable with its fairy tale square tower. Piece of advice. Better to arrive at the opening time at 11 am if you want to take advantage of one or two guided tours (included in the entrance price – more info below). There are several different places to visit: the apartments, the Chapel, the King’s Tapestries, The Canon Tower and the Casemates (in the basement). Have a walk around the castle to see the canons, the fishermen by the water, and the castle from another point of view, as well as to catch a sight of Sweden across the Sound! Guided tours. Either in Danish or in English, you can join guided tours based on different topics: Introduction to Kronborg Castle, In Hamlet’s Footsteps, Introduction to Casemates, and The Royal Banquet. Don’t miss times because it goes from 11:30 am to 2:30 pm (welcome to Denmark! ), so there aren’t so many of them every day. More info here. In the evening, we stayed to have dinner at Madam Sprunck Restaurant, recommended by our travel guide. Well, our dishes (winerschnitzels) had nothing exceptional but the service was good and the place is nice. Do you know Helsingør? What have you preferred the most? Read also about our trip to Roskilde. Stunning pictures! Helsingør seems breathtaking! Thanks Agness! Yes indeed, it’s a very nice small town to visit and enjoy a bit of Danish atmosphere.